As expected, the crossover event between Capcom’s Monster Hunter World and CD Projekt RED’s The Witcher 3: Wild Hunt begins today, it’s been announced. 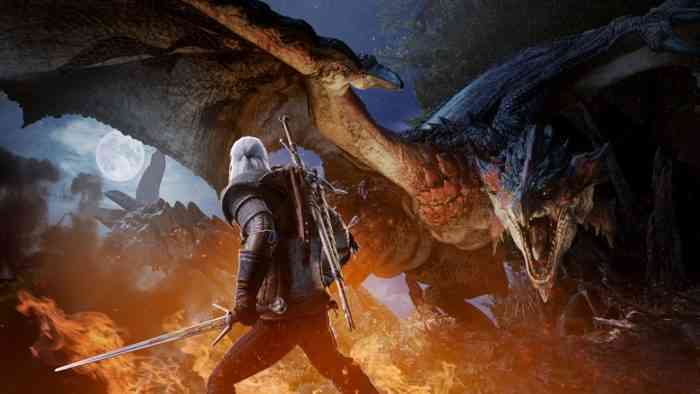 Available now as a free a tittle update (later on PC) for Monster Hunter World, the Monster Hunter World x The Witcher 3: Wild Hunt crossover event sees The Witcher 3-themed content — including the infamous Geralt of Rivia — enter the world of Monster Hunter. The crossover content revolves around a new, original quest line available for all players who have reached Hunter Rank 16 or higher. The quest is titled ‘Contract: Trouble in the Ancient Forest’ and it stars The Witcher’s Geralt of Rivia (still voiced by Doug Cockle) who must track down and deal with a powerful force known as the Leshen. Players will have the White Wolf’s arsenal and abilities, including his silver sword and combat magic, to try and defeat this mysterious creature. Just like Witcher fans are used to, players will also engage with people using dialogue options, which will influence how the story unfolds. Completing the quest will “earn players unique, Witcher-themed special items, resources for crafting Geralt’s armour and weapon set, a unique skin and weapon for the player’s Palico companion, as well as new gestures, titles, pose, and guild card background.” Other rewards include the resources needed to craft the armour and weapon set of Ciri, another iconic character from The Witcher 3. Also announced was a new multiplayer event coming February 15th. Players with Hunter Rank 50 or above can participate in ‘Contract: Woodland Spirit,’ a new “extremely challenging” timed event that pits players against a much deadlier form of the Leshen. It ends on March 1st. Are you excited to try this new content out? Share your thoughts below.